We’d love your help. Let us know what’s wrong with this preview of Magic Marks the Spot by Caroline Carlson. To ask other readers questions about Magic Marks the Spot, please sign up. Do Charlie and Hilary have a crush on each other? Aaron Yes, but they will flesh that plot out later. What is the reading lexile level for this book? This is the most unadulterated fun I've had reading in quite some time. I wanna kiss this book square on the mouth. Well, me hearties, I’m a disappointed pirate. This should have been a ripping good voyage, but I’d be a liar to say it was. I may be a burglar, but I like to think I'm an honest one. This ship’s log was as dry as powder – it was very difficult to read as far as I did. There were one or two singularly funny entries which stood out all the more because the rest of the log was decidedly not funny. Aside from that, we’ve a rum crew onboard. Other than a very cute stone gargoyle with a love for Treasure Island, the rest of the lot are the same old, tired and annoying crew you find on other ships. For the last straw, this ship kept raising the colors of feminism. All the female characters are perfect and capable in every way whereas all the men in the story misfire like a badly-trained gun crew. As for the voyage itself, it seemed at first that we might have something interesting on our hands bur then our ship was taken-all-a-back by a hurricane of cliches followed by a violent boarding by the Pirate League of Tropes who insisted that our main crew member be nothing more than the: “I’m a girl so I hate embroidery and dresses and I can do anything a boy can do” character. I don’t know about you, my fellow freebooters, but this sort of trope and character just takes all the fun out of pirating and sits worse in my stomach than a bottle of bad grog. In conclusion, too much ballast and poor navigation sent this ship right down to Davy Jones Locker before it had barely cleared the harbor. Tis a shame, but after following this poorly drawn map for a time, I finally skipped to the end expecting to find treasure and found nought but an empty chest. "Magic Marks the Spot" Misses the Mark! 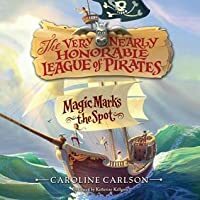 "The Very Nearly Honorable League of Good Pirates: Magic Marks the Spot" has all the elements of a good story: a precocious girl, a talking gargoyle, a Great Enchantress, pirates, and a hidden treasure map. "Magic Marks the Spot" started slowly. After the first few chapters, the story appeared to be a bit silly and far fetched, but still a good yarn. Hilary's pet gargoyle is cute (I imagined him as a cross between a talking dog and a cat with wings) and while the introduction of magic to the story was somewhat awkward, it did add a level of intrigue and excitement. However, while there's nothing wrong with a good farce, as the story unfolded, it was almost like it couldn't decide whether or not to take itself seriously. Lots of threads are introduced, but not followed through with. Several characters are presented as simple caricatures, with relationships and behavior that just don't add up. And for me, without giving too much away - once I discovered who the Great Enchantress was, I found her to be rather disappointing. "Magic Marks the Spot" started out with great promise. Unfortunately, this was one of those books that had all of the makings of what should have been a delightful read, but just didn't pan out. Please don't get me wrong - it wasn't terrible. It does have some fun parts and there are probably many little girls who would find it entertaining. However, there are so many excellent children's books available, that one can afford to, and therefore should be, choosy. I received this book for free as part of Goodreads First Reads Program. This did not, in any way, affect my review. A copy of Magic Marks the Spot was provided to me by HarperCollins/Edelweiss for review purposes. After recently being denied admittance to The Very Nearly Honorable League of Pirates simply because she's a girl, Hilary is now being forced into attending Miss Pimm's Finishing School for Delicate Ladies. Not that she has any desire to become a Delicate Lady. She can tread water for 37 minutes, can tie a knot that cannot be undone and hates dresses because dresses make climbing ship's rigging next to impossible. While Hilary is quite the vibrant character on her own, her gargoyle side-kick provided the comic relief when the story veered too far into weighty territory. The weighty territory mostly involved the odd choice in bad guy, which was a bit of a shock and surprise, however it was handled well. While the story was only occasionally serious, the remaining characters were still just as lighthearted making this a perfect read for young kids. In addition to the story there are between chapter snippets of letters, newspaper articles and other assorted information that was a charming addition. Magic Marks the Spot is an extremely cute Middle Grade novel that comes equipped with a super spunky heroine, entertaining pirates, magical gargoyles and treasure hunting adventures. While this works as a stand-alone novel with its solid wrap-up ending, it's actually a brand new start to a planned trilogy. Definitely looking forward to future mischief from Ms. Hilary! After my last middle grade was such a terrible dud, I was a bit afraid to embark into these pirate-laden waters. What if I felt like they'd shivered the timbers of these books unfairly, robbing them of a better life for inferior content? Or stole away my precious time, better spent with other books? Thankfully, Caroline Carlson's pirates aren't such vicious fiends. They're quite honorable, as pirates go anyway, and entirely lovable. 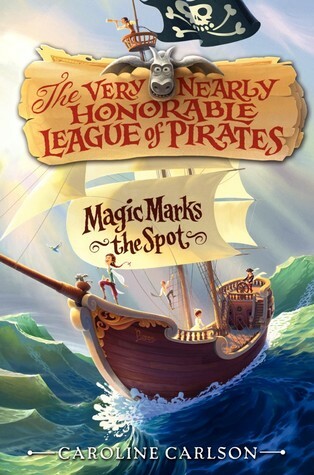 Magic Marks the Spot is pretty close to perfect for what I want After my last middle grade was such a terrible dud, I was a bit afraid to embark into these pirate-laden waters. What if I felt like they'd shivered the timbers of these books unfairly, robbing them of a better life for inferior content? Or stole away my precious time, better spent with other books? Thankfully, Caroline Carlson's pirates aren't such vicious fiends. They're quite honorable, as pirates go anyway, and entirely lovable. Magic Marks the Spot is pretty close to perfect for what I want from a light-hearted middle grade: humorous, populated by lively characters, and promoting the idea that both boys and girls are capable of the same sorts of things. Before I even got to page one, Magic Marks the Spot had already made me smile and snort. See, before the page numbers even start counting, there are several pages of letters, which set the tone for the rest of the novel. In fact, letters, documents, and snippets of books are woven brilliantly throughout the novel, a technique often used, but rarely done to quite so enjoyable effect. "I assure you that I will walk the plank a thousand times, into cold and shark-infested waters, before I will attend Miss Pimm's. Really Quite Furious with You"
From that moment on, I was in love with this book and its characters. Hilary is a fantastically sassy girl who refuses to let anyone, be they parent, headmistress or pirate, tell her what her gender means she can and cannot do. Magic Marks the Spot is so girl-positive and anti-stereotypes. Pirates can be friendly, girls can be pirates, boys can sew without it doing them a lick of harm, governesses can be sassy, and old ladies can be badasses. These are excellent lessons for the intended age group, and are conveyed in a totally non-preachy way. Look at her finding treasure. WE GOT THIS. Though almost everyone she meets tells Hilary she cannot be a pirate because of her gender and social standing, she does not give up. She has a dream and will not let anyone stop her from getting there. Plus, she has a plucky gargoyle sidekick to help cheer her up when times get rough, like when she's forced to attend Mrs. Pimm's, which teaches courses like etiquette and fainting. Gargoyle is so completely precious, with his desire for ear scratches and dream of one day having a pirate hat. Who doesn't want a pirate hat? Hilary's governess, introduced as a rather drab, formidable figure, turns out to be wholly delightful as well. As soon as she ceases being Hilary's governess, she's able to open up to Hilary and truly be a friend. Eloise Greyson is a wonderful human being, and I totally support the ship of her with the pirate captain Jasper, Terror of the Southlands. He's basically the most lovable pirate after Captain Shakespeare from Stardust. Oh, and Charlie, his first made is adorably awkward, and I am waiting for some super cute middle grade romance to happen later. And this is why Jasper is second, even though he too has a fine sense of fashion. Magic Marks the Spot kept me grinning and laughing the whole way through. There's situational humor, sarcasm everywhere, and silly puns. Basically, it's perfection for me and other people who have the sense of humor of a ten year old, like, say, actual ten year olds. I see this being a huge hit with the intended audience, but it's a delight for an older reader as well. Not quite what I expected but it was enjoyable with lots of funny moments..
Hilary Westfield, daughter of admiral James Westfield, a wanna be pirate, gets sent to Miss Pimm’s Finishing School for Delicate Ladies against her will, and wasn't accepted in the "Very Nearly Honorable Lague of Pirates" because she's a "girl".. Her Gargoyle, with magic in his heart, who I found to b Not quite what I expected but it was enjoyable with lots of funny moments.. Her Gargoyle, with magic in his heart, who I found to be quite cute..
Jasper Flecher, handsome pirate and captain of the ship "The Pigeon" , looking for the "Enchantress Hidden Treasure" with his companion Fitzwilliam Fletcher (the parrot) and who started it all..
Miss Grayson, the Governess, who gets involved in the adventure after Hilary escapes from school..
Claire, daughter of the fisherman, a crazy dudette, who wants to be a part of the high society.. The enchantress, whome I discoverd the identity quite early, was kind of disppointing, totally, she could have done better.. The material for this book was awesome, but the result was not really satisfying.. The letters and notices at the end of each chapter seemed interminable. I started to dread the end of the chapter because of them (then I started skipping them, tralala). This was too unbelievable and ridiculous, and coming from me, that's saying a lot. I mean, Hilary's own father doesn't even recognize her? I don't care how detached you are. You'd recognize your own daughter. Besides that, I don't know if I'd want my hypothetical kids reading a book in which the heroes say, 'We are always o Eh. The audiobook for this is FABULOUS! It was a fun adventure, and the slightly steampunk world was a pleasant surprise! Still, I thought some parts of the world and plot could have been explained better, and ultimately, I think it will be a fairly forgettable story, even though I enjoyed it while reading it. In short: Magic Marks the Spot by Caroline Carlson is a whimsical and light-hearted story that never takes itself too seriously. You got to bet this one caught my eye immediately because a) I love cute middle grade books with cute middle grade covers, b) I love fun titles, and c) I love pirates. And Magic Marks the Spot delivered exactly what it promised: a whimsical and light-hearted story that had me chuckling at its brilliant tongue-in-cheek humour. Hilary desperately wants to be the most fearsome pirate of the High Seas, but when The Very Nearly Honourable League of Pirates says that no girl is to join their ranks, she sets out to find her own way to make it happen by looking to uncover the most prized treasure known. The humour and the characters are what makes a book like Magic Marks the Spot shine. The pirates were basically parodies of what pirates are thought to be - scourges and scallywags - and debut author Caroline Carlson adds a lot of comedy poking fun at the stereotypical pirate image. The characters are all a bit two-dimensional, but I guess I don't expect much complexity from such a light, easy book. Even though the characters weren't complex, they were plenty vibrant. Magic Marks the Spot is one of those books that makes you wish you were listening to it via audiobook instead because you know a narrator could have had a lot of fun with these quirky characters. I think my only complaint stems from one of the book's strengths: it's light-heartedness, while totally fun, kind of took away from any suspense in the book. I know pirates to live dangerous lives, and there are certainly pirate ship fights in Magic Marks the Spot, but at no point is any character in any real danger at all; there are only mild troubles here and there. And you can't tell me it's because it's an MG book and they needed to tone that down. You can still have a clean book for MG readers and have a little more tension there! summary: Hilary wants to be a pirate more than anything else. Unfortunately, she is being sent to Miss Primm's School to be a proper young lady. She escapes with her friend (a magic talking gargoyle) and finds herself employed on a pirate ship in search of the lost treasure of the Enchantress. my review: loved it! I found the gargoyle and the governess a little cheesy at times but I think that young readers would find them endearing. I really like the female protagonist...the book is very "girl power" without being bashing one over the head with it. Good fun and rather funny at times...especially the course work taught as Miss Primm's (ex)swooning). It's part of a series...but I honestly don't think that a second or third book with these characters would hold my attention. I do enjoy books about pirates! MAGIC MARKS THE SPOT tells of Hilary Westfield's journey to become a pirate, complicated by the facts that she's a girl and the daughter of an admiral. I have always enjoyed girl-crossdresses-as-a-boy stories, but that is not this one. Hilary is determined to do it all as a girl. MAGIC MARKS THE SPOT is a very fun story, filled with a search for treasure and mysterious thieves and unexpected magic. I'm not sure it's a great start to a series, because it stands very I do enjoy books about pirates! MAGIC MARKS THE SPOT tells of Hilary Westfield's journey to become a pirate, complicated by the facts that she's a girl and the daughter of an admiral. I have always enjoyed girl-crossdresses-as-a-boy stories, but that is not this one. Hilary is determined to do it all as a girl. I adored this book, I found myself chuckling to some of the antics and happenings for our young Hilary. Hilary longs to be a pirate on the open seas and skip finishing school for high society girls. How is a GIRL with a pet gargoyle going to escape her governess and Miss Primm's finishing school to become a pirate? This will make a SHIVER ME TIMBERS bedtime read-aloud for parents to enjoy with their kids. Be warned, they will probably be begging for one more chapter each night :) Or your indepen I adored this book, I found myself chuckling to some of the antics and happenings for our young Hilary. Hilary longs to be a pirate on the open seas and skip finishing school for high society girls. This will make a SHIVER ME TIMBERS bedtime read-aloud for parents to enjoy with their kids. Be warned, they will probably be begging for one more chapter each night :) Or your independently reading child will be found under the covers with the flashlight sneaking in more reading time. The variation in the reading to include letters in different typeset is a nice touch and a map is always a good idea. Grab your pirate hat and set sail on the first in the Very Nearly Honorable League of Pirates series. Awesome book for the whole family. There are many books with female lead characters but it's refreshing to read a book about a little girl who doesn't care about being girly, pretty, or being a princess. It's just as refreshing to read a pirate story that features a heroine. A girl who wants to be pirate. How cool is that?! This is a book full of excitement, fun twists and turns, and humor. It's such an enjoyable read for grown-ups and children alike. Fun reading! A wonderful creation of another world, full of adventure. Loved the ending. This book was a delight to read. It was funny from beginning to end. I know this book was definitely written for children but I don't care. I laughed and enjoyed this book a lot. It's a fun book to read if you have four hours to spare on the weekend to laugh at this ridiculousness. The book was about this girl called Hilary Westfield whom is the daughter of an Admiral of the Navy and she wants to be a pirate. But of course, girls can't be pirates. She gets denied by the pirates and by her parents. And she is then forced to be sent off to Miss Pimm's school for delicate ladies. Hilary, clearly set on being a scallywag pirate takes it upon herself to escape the school and go to sea. I thought the plot of this book was going to the old trope of Miss Pimm's girls being bratty and snobbish and putting them as all evil girls. Like demonizing girls for wanting to be girly and that sort of thing but it certainly didn't. It played on that trope, yes, but it was only one of them that was bratty. The others were not mean and just frightened by that bratty one. Hilary even made a friend named Claire in that school before setting out to sea and they even exchanged letters. Their friendship was so cute and sweet. I caught myself going "Awwwww!!! Claire is the best." This book definitely dragged on at parts and for a pirate adventure, it didn't have a lot of action and bloodshed but I know I know, this book was written for kids and not sadistic me. Everyone, even the pirates were so polite. I'm glad I had text to speech with the English UK language on to read my book because it made the whole thing 110% times better. Everyone spoke politely and with a british accent and I think that's why I laughed more in this book. It's not boring but it wasn't nearly as exciting. It definitely would look better from a kid's perspective even if I'm a kid myself at heart. I'm gonna give this book a 3 stars out of five. Its a nice read and would recommend if you're feeling to read a light hearted book. 4.5 stars. A very pleasant adventure book with a nice girl who wants to be a pirate. There are many good things to say about this book, especially with a premise like a girl who sees herself as a pirate, even if women are forbidden on boats in this society. Hilary had a strong minded desire to be herself, even if she was challenged by several persons, and it was clearly pleasant to witness the world adapts to her desire rather than the contrary. She was nice and friendly, not just fierce, and she 4.5 stars. A very pleasant adventure book with a nice girl who wants to be a pirate. There are many good things to say about this book, especially with a premise like a girl who sees herself as a pirate, even if women are forbidden on boats in this society. Hilary had a strong minded desire to be herself, even if she was challenged by several persons, and it was clearly pleasant to witness the world adapts to her desire rather than the contrary. She was nice and friendly, not just fierce, and she succeeded to make friends among other kids and adults, which was nice, especially as the cast was balanced with boys and girls. The gargoyle pet was a good addition to the team, you can never say no to a good gargoyle! This book is soooo cute! I love it so much! Adorable MG fiction is the panacea, I am quite sure. So, in a nutshell, read this because of crochet hooks, magical uniqueness, pirates, and gargoyles. The story was okay, but even though there was action, it felt slow. I did like the magic in this story, and that it was available to everyone. I liked the gargoyle and Jasper; they were amusing. Hilary and her governess were okay, but I didn't like the other characters. I was surprised by the villain. The book itself is hilarious, and Katherine Kellgren’s narration puts it over the top! I cannot even with how perfect this audiobook is. Definitely a new favorite! This was soooooooo delightful! I actually laughed out loud a couple times. Katherine Kellgren did an amazing job reading it - such fun to listen to. Just what I needed. GREAT audiobook.